Scotchmallows Soft & Chewy, Better than See's Candy. Spray a 9 x 13 pan with nonstick spray and then line the bottom with parchment paper to fit. This is important to be able to remove the scotch mallow insides from the pan. Place sugar, butter, light corn syrup, and evaporated milk in a heavy saucepan (make sure you use a large pan because it will boil up and over if you don't..trust me on this one). Cook on high heat until temp reaches 210F. Reduce heat to medium and continue cooking and stirring constantly until the mixture reaches 240 (just below firm ball). Remove from heat and add vanilla and stir in quickly. Pour into 9 x 13 pan, spread out and let cool completely so as to not melt the marshmallows you will be adding next. When the caramel has cooled, with a paper towel blot any moisture that may have developed on top of the caramel. It is now time to make your marshmallows. Place gelatin and 1/2 cup ice cold water into mixer. Set aside. Combine 1/2 cup water, sugar, corn syrup and salt in a heavy saucepan and cook until it reaches 240 F. No need to stir. Remove from heat immediately. Turn mixer on a slow speed using a whisk attachment. Slowly pour hot syrup into mixer. Once you have added all the syrup into the mixing bowl, turn on high and mix until the marshmallow becomes lukewarm, approximately 10 - 15 minutes. Add vanilla and mix for a minute longer. Pour 1/2 of the mixture on top of the caramel and spread evenly. You can use as little or as much marshmallow as you want. it is your personal preference at this point. If you have never made these before, it might be a good idea to start with half and go from there. Put the rest of the remaining marshmallow either on a silpat sprinkled with powder sugar or parchment sprinkled with powder sugar (you can use these marshmallows for whatever you want, s'mores, hot chocolate, dipped in chocolate). Smooth the marshmallows out with a wet hand (really this works), sprinkle with powder sugar and let dry for at least 4 hours, or over night. You do not need to refrigerate, but it may help in the cutting into squares later. When the marshmallows (the ones on the caramels) have dried sufficiently so that they are no longer sticky, turn the caramel/marshmallows out of the pan onto a piece of parchment which has been dusted with powder sugar. 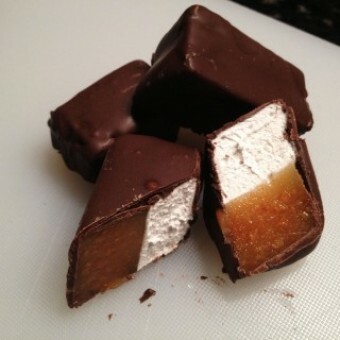 Using a sharp knife that has been heated with hot water from the sink, cut your scotch mallows into 1 inch squares (or somewhere around that size, again personal preference) insert a toothpick in each one. Place in fridge for at least an hour so that you can work in small batches because when the caramel gets warm it melts and gets kind of messy when dipping in chocolate. Melt chocolate in a glass bowl in a microwave as per instructions on your chocolate. Using the toothpick as a handle, dip the candy into the chocolate and lift out and spin back and forth until most of the excess chocolate has come off. Carefully place on a piece of parchment paper. Continue working in small batches keeping the pieces cold so that they do not get all melty in the chocolate. Using a fork and a chopstick or something like that, drop one square into chocolate, spin around, lift out and tap and squeegie the chocolate on the side of the bowl until most of the excess chocolate has come off.